Welcome to my blog on housing, culture, and design. If you're new to it - although I'm celebrating 26 years as a top producing Toronto realtor - my passion for all aspects of housing and home has led to my writing on many facets of urban life. My research and education includes a Canadian Social History Degree which focused on how the migration patterns of different cultural groups influenced Toronto's housing market from 1850 to 1970; an Urban Studies Degree that explored Gentrification in South Riverdale in the 1980s; and a Graduate Degree in Environmental Studies that researched the development of Adaptive Re-use Conversions into loft condominium living, including a fascinating psychographic analysis of its residents. It's how I launched my career as a Housing Conceptualist and Real Estate Marketer in the mid 1990s, spearheading the Innovative Space Marketplace specializing in new loft conversions, and eventually expanded to my love guiding clients in the buying and selling of unique urban character dwellings, architect-designed low maintenance living, and smart-buy investment properties at Urbaneer. With training in finance, construction, urban planning, urban design and the psychology of housing and home - and a whole lotta rejuvenating, renovation and transforming my own personal dwelling, including The Button Factory on Clinton Street, The Movie House at College and Euclid, an 1880s Vintage Triplex In PEI, and - in progress - a 1960s purpose built duplex in Riverdale, I love a good design story. 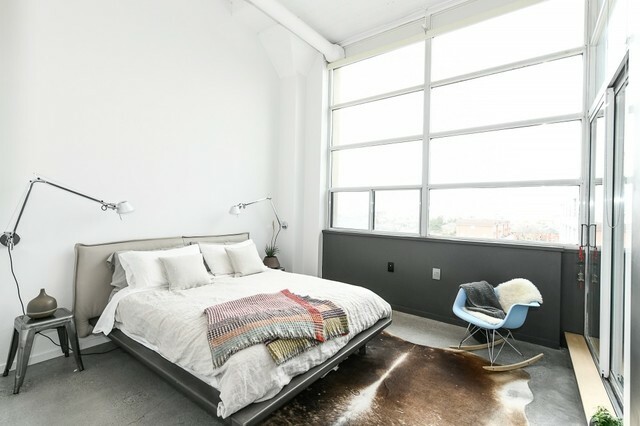 So when the call came from a design duo to list their loft, I was both mesmerized and impressed at their undertaking. And I couldn't wait to feature it on the Urbaneer blog! 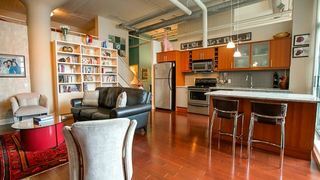 Located north of Eglinton Avenue east of Dufferin, The Forest Hill Lofts - once the Canadian headquarters of Coats Paton, a textile firm famous for its Beehive brand knitting yarn, dating from the 1930s, was converted into 137 loft condominiums in 2002. 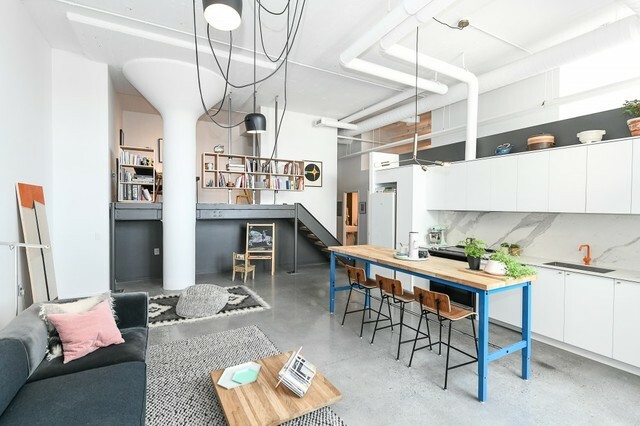 Ranging in size up to 1108 square feet, the lofts feature 13' ceilings, exposed structural elements of steel or fluted concrete columns, and large expanses of glass. However, like many redevelopments, the original fixtures and finishes used for the conversion were builder grade items, often mediocre in quality, and not necessarily complementing a factory aesthetic. Back in March 2017 the architect design professional duo purchased the unit with the intention of making it their home for several years. However, just as they were completing their reimagination of the space, a new job prompted a relocation. As a result, the property has come to market with the intention of recovering their cost. 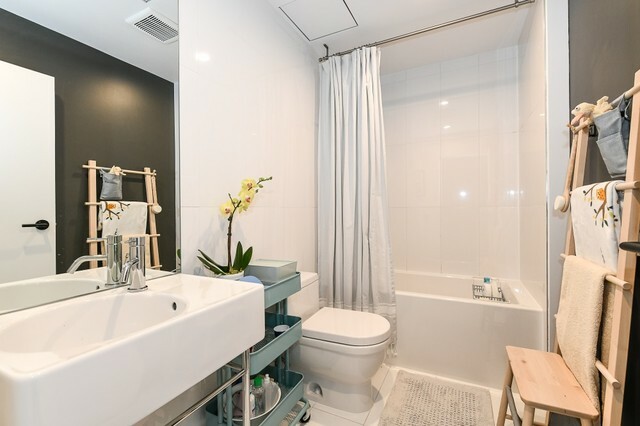 Here's what the unit looked like when they purchased it, with its very early 2000s aesthetic of cinnamon wood floors and cabinetry, builder grade washroom fittings, and dated light fixtures. 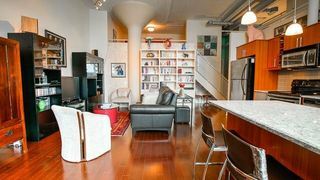 "The mezzanine was originally partially enclosed by a wall that encased the side of the floor deck and reached just 3 feet shy of the ceiling. Although intimate, the space was dark, and a closet truncated the usable floor area, leaving the room small, uninviting and lackluster. When we first saw the unit, a bed occupied most of the floor space with little room for anything else. 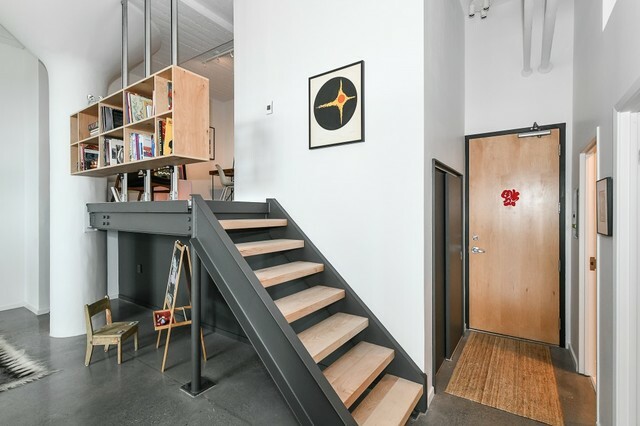 Furthermore, the wall enclosing the mezzanine extended to the living room floor, removing what could be additional square footage perfect for our young son to use, while visually opening the living space and articulating the mezzanine loft as a feature of interest. Originally, one would take the stairs to the mezzanine with the sole purpose of entering a second bedroom, as opposed to accessing a second level for 'living'. Removing the wall encasing the mezzanine and setting it behind the staircase exposed the structural steel deck of the mezzanine and freed the unique structural column, allowing it to be an architectural feature in the space. This reinforced the interpretation of the mezzanine as a separate level, as well as returning the unit to that raw, industrial loft quality. Additional space was found by pushing the former back wall of the closet to align with the face of the entrance closet below. 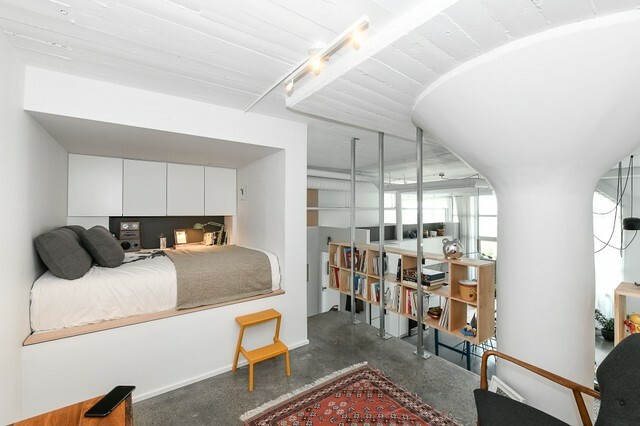 The additional two feet provided enough room to create an intimate double bed platform with some shelving, a perfect place for some rest and seclusion. 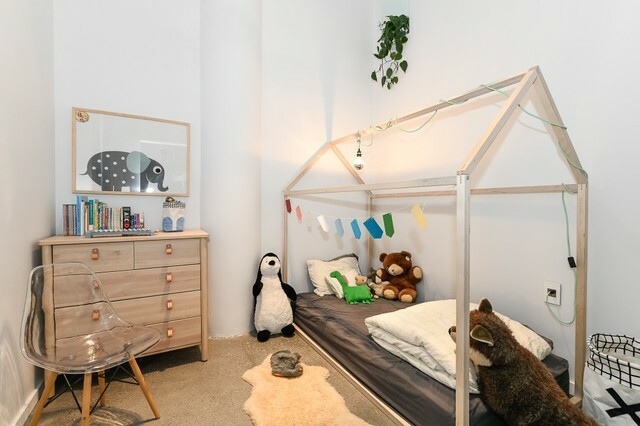 It's a terrific guest room, or alternate third bedroom if required. Overall, these interventions allow a complete continuity from the glazing on the lower level to the back wall of the unit on the upper level. The former open “den”, used as a dining area by the previous owner, was sandwiched between both washrooms along the corridor. This was an odd communal/gathering place, which didn't feel welcoming among the more intimate and private zones for domesticity, including the master bedroom along. Knowing this area would better function as a second bedroom, a partial height wall was built to create privacy while allowing daylight to enter. The addition of a light well brings some sunlight from the master bedroom into this bedroom as well as creating some visual interest to the intimate space.The original kitchen and washroom millwork/fixtures felt dated and better suited for more typical suburban home than an industrial loft. Mismatched wood finishes in the kitchen, on the floors and in the washrooms made the space seem visually cluttered. The kitchen millwork was updated to a clean matte white with a monolithic porcelain backsplash and counter. The washrooms were also fully updated, one with a soaker tub and another with a walk-in shower, all done in a mix of glossy and matte whites. 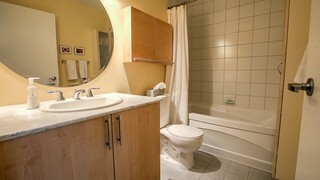 Omitting millwork in the bathrooms was done intentionally to have these rooms read as functional, clean and timeless". "Connectivity, to each family member, to the outdoors, and to history co-exists with private and multi-functional spaces creating a unique urban retreat in this former garment factory. The corridor from the main entrance to the kitchen serves as the primary axis separating the private (bedrooms and bathrooms) from the collective convivial spaces (kitchen, dining, and living room). The “floating” bookshelves along the edge of the mezzanine - made using more utilitarian materials to feel more honest and factory-friendly - create a secondary axis bridging the lower open area to the upper mezzanine area while defining them as separate spaces. At the intersection of the axis, the “nook” encloses a custom built-in sleeping area (upper level), three separate and concealed storage areas, a coat closet and the stacking washer/dryer. The outdoor terrace is an extension of the interior space and a private sanctuary. To one side, the dark grey reinforces the continuity of the interior west wall while the plant life creates a boundary of intimacy and tranquility. On other side, the continuous glass wall blurs the physical limits of the interior and exterior spaces, its transparency allowing the unit to bask in natural light. A limited material and colour palette serves to enhance the feeling of calm and openness. 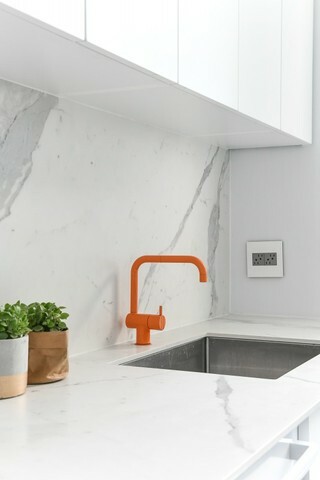 The predominant use of white reflects the abundant sunlight that enters the space, acting as a blank canvas against the polished concrete floor and the raw industrial nature of the steel mezzanine and staircase. The simplicity of the architectural millwork, and lighting, the use of natural wood (maple) along with the deep grey accents serve to create balance, depth and texture within the space, while the diaphanous draperies soften the environment while filtering the west light". To walk into this space makes one acutely aware of that the level of creativity, thoughtfulness, and attention to detail undertaken is exceptional. Here are the features I particularly treasure! - the balance of infusing contemporary elements while respecting the iconic factory style and industrial heritage. Given this family are ready to relocate now, they're letting us steer the sale in the hopes they can recover their acquisition, renovation (around $100k), buying and selling costs, by listing the property with the strategy of coming to market with a holdback on offers. You can read about this as it pertains to both Buyers and Sellers. 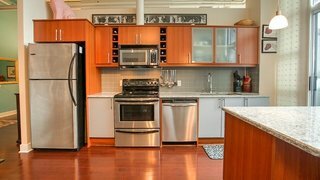 Want to learn more about this property, offered for $599,000? I Tip My Hat To The Sellers' 'Cabin Bed', as I created one myself! We've got another for you! 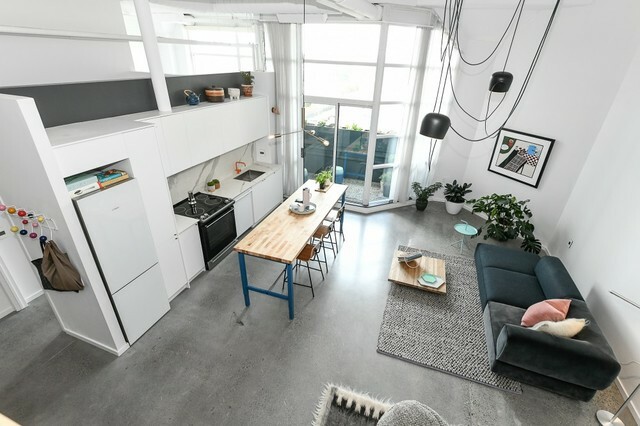 If you'd you've always wanted to own your own slice of heaven in one of the vibrant neighbourhoods east of the Don Valley, here's a new loft listing in Riverdale's Glebe Lofts on Pape Avenue, which was converted from a Presbyterian church into residential units two decades ago! 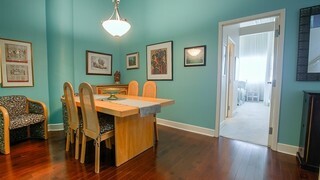 We call it: A Heavenly Sanctuary In A Converted Riverdale Church - offered for sale for $949,000!! Love Design Like I Do? 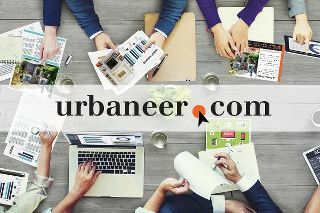 Can The Urbaneer Team Assist You? Are you thinking of selling? We’d be delighted to develop a productive sales strategy from start to finish that will maximize results. We have specific construction, design and custom trades to execute upgrades and repairs. We also have relationships with several retail home furnishing retailers, plus our own cache of furnishings to draw on as necessary to elevate the properties we sell. Clients often simply hand their keys over so we can work our magic, trusting us implicitly, while others prefer to rely on our guidance and support to reinforce or steer their particular aesthetic. Check out our advice on How To Prepare Your Home For Sale and how Urbaneer Markets Toronto Real Estate, including our focus on The Power Of Social Media. Are you considering buying Toronto real estate? The process of choosing the right property can be overwhelming, both in finding the right property in terms of location, condition, size and price, as well as negotiating its purchase in a rational, educated, and prudent way. It starts with How To Search For Your Next Property Purchase, but we'd love to show how our proven process can work for you. Check out How Urbaneer Helps Buyers Make The Right Real Estate Purchase. *Like what you've read? Did you know we were recently listed as one of The Top 25 Toronto Real Estate Agents To Follow On Twitter! and The Top 50 Blogs On Toronto? Consider signing up in the box below to receive our FREE monthly e-newsletter on housing, culture, and design including our love for unique urban homes and other Toronto real estate!